A lecture on the spirituality of the former UN Secretary General, Dag Hammarskjöld, revealed the extent of his role in the creation of a prayer room at the UN headquarters. 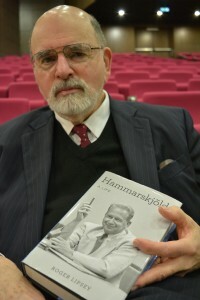 Dr Roger Lipsey, author of ‘Hammarskjöld: A Life’, an acclaimed biography of the Swedish diplomat, told the lecture hall in Gonzaga College of Hammarskjöld’s deep interest in Christian mystical and ethical teachings, notably those of Meister Eckhart and Thomas à Kempis. 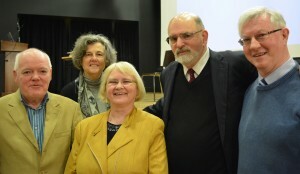 The lecture was hosted by the new Spirituality Institute for Research and Education (SpIRE). Dag Hammarskjöld (1905 – 1961) was the second Secretary-General of the UN. It was Hammarskjöld who is credited with having coined the term “planned economy”. After his death in 1961, his spiritual journal ‘Markings’ was published in 1963 and it revealed the extent of his inner spiritual life. Speaking after the lecture, Dr Roger Lipsey told CatholicIreland.net that Hammarskjöld only disclosed twice publicly the nature of his spirituality and his role in the prayer room was the most important one. Separately, Dr Lipsey called on the British and American governments to “disgorge” any information they hold relating to the death of the former UN Secretary General in a plane crash in Africa in 1961. The American writer reiterated an appeal made by Ban Ki Moon to the UK and the US to release documents which could help solve the mystery around the Hammarskjöld plane crash. The UN Secretary General, whom US President John F Kennedy described as “the greatest statesman of our century”, was killed along with fifteen others in September 1961 in what is Zambia today, as he was trying to negotiate a ceasefire in Congo. A report prepared by members of an Independent Panel of Experts appointed by Ban Ki-moon to examine new information related to his death gave credence to new eyewitness accounts which suggested that Hammarskjöld’s plane was already on fire as it landed. There are some suggestions that it was shot down by fighter jets. Former US President Harry Truman said Hammarskjöld “was on the point of getting something done when they killed him”. Raised in Uppsala in Sweden, he loved mountaineering and in his apartment in New York he had an inscription from Tenzing Sherpa, who had climbed Mount Everest with Hilary, telling the Swede ‘You may climb even higher.’ But he knew, as his journal Markings documents, it was ‘Not I but God in me’. He enjoyed his interactions with journalists and was able to retain sensitive information but also disseminate information. By the 10th anniversary of the UN in 1955 he was on the cover of Time magazine as a major public figure. He was grappling with engaged spirituality and how spirituality can become a guiding and stabilising force in the lives we lead. As the Suez crisis of 1956 was unfolding and the British, French and Israeli secretly conspired to bring down the Nasser government, it was to psalms 4 and 37 that Hammarskjöld turned. He had two views of the Suez crisis – the private one was his “moral shock” at the perfidy he saw. But by the end of the year he was documenting in his journal his “gratitude” and reflecting on selfless service. His spirituality in ‘Markings’ documents his engagement with the primacy of the present moment.